Learn how to make broccoli rice with three easy preparation techniques. This simple recipe creates a low-carb, Paleo and Whole30 alternative to grains. Saute, steam or eat this vegetable rice raw for a nutrient-rich side dish. Broccoli rice is a healthy fiber-rich side dish when you’re looking for a grain and gluten-free alternative. We’re all familiar with eating broccoli florets cooked different ways. It’s most likely the first vegetable that most of us were introduced to as kids. It’s not a surprise, the cruciferous green from the Brassica family delivers nutrients like vitamin C, E, K, folate, calcium, potassium, omega 3 and 6 fatty acids, protein and dietary fiber. No wonder our parents kept pushing those little green edible treetops! Rice alternatives have become popular to add to meals because they are easy to prepare and neutral in flavor like cauliflower rice. Broccoli can be made similarly with three simple techniques; chopping with a chef’s knife, food processor or blender. Once the broccoli is cut into pieces the size of grains of rice, it can be cooked in different ways and will be a new go-to recipe. Incorporating broccoli into your meals will boost your plate with extra nutritional benefits. Here are the simple ways to prepare and cook the rice. Use a chef’s knife to cut the broccoli florets into small 1-inch pieces. Chop into smaller grain sized pieces, keeping some of the florets intact. This method takes the longest, but worth the extra time. Cut the broccoli into 1-inch florets. Add about 4 cups of florets or 3/4 of the way full in a food processor, working in batches as needed. If you have a larger unit, more florets can be added. Pulse the broccoli until small rice-sized pieces are formed and scrape the sides of the bowl as needed. Cut the broccoli into 1-inch florets. Add about 4 cups of florets in a high-speed blender. 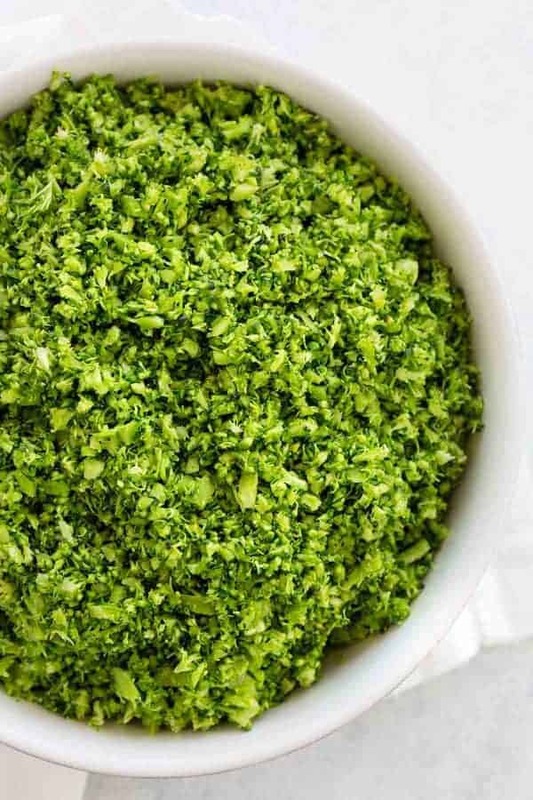 Blend the broccoli until small rice-sized pieces are formed, using the tamper handle on top to push down the florets, about 15 to 60 seconds. Scrape the sides of the blender cup to process the florets evenly. This recipe is made to mimic white or brown rice. Two heads of broccoli will yield about 4 cups of rice once chopped down. The volume reduces by about half. Now that you know how to prepare the broccoli rice, there are numerous ways to cook it. The cooking methods below are for 4 cups of rice. I’ve found that a light cooking of the broccoli makes the florets less chewy in texture and tames the sulfurous flavors. The broccoli should be cooked until bright green with some bite, not to the point of being mushy. Sauté: Heat a large pan over medium heat, sauté the rice in 1 tablespoon warmed oil or butter until tender, about 2 to 3 minutes. Stir-fry: Heat a wok and 1 tablespoon vegetable oil and 1 teaspoon sesame oil over high heat. Add rice in a single layer, allow to cook until lightly browned for about 2 minutes. Steam: Add broccoli to a medium-sized microwave-safe bowl. Mix with 1 tablespoon of oil and cover tightly with plastic wrap. Microwave for 2 minutes, stir and cook another 1 to 2 minutes until tender. Casserole: Add broccoli rice in with casserole ingredients and bake. The broccoli stalks or stems can also be eaten so don’t throw it away! Simply peel the tough outer layer with a paring knife and cut into smaller pieces. It can be added to the florets to make broccoli rice. It may take a few more minutes to make tender, but they are packed with nutrition and have a pleasant flavor. Use a knife to cut the broccoli into 1-inch sized florets. Select a technique below to breakdown florets into rice-sized pieces. Knife: Use a chef's knife to finely chop the florets into smaller rice sized pieces. Food Processor: Add florets 3/4 full into a food processor and pulse until small pieces form, scraping the sides of the bowl as needed. Work in batches if needed. Blender: Add florets to a blender and process on medium-high speed until small pieces form, about 15 to 60 seconds, scraping the sides of the container. Work in batches if needed. Saute Method: Heat a large saute pan over medium heat. Add oil, once hot add the broccoli rice in one layer. Allow to cook until rice becomes bright green and tender, about 2 to 3 minutes. Season with salt and pepper as desired. Steaming Method: Add broccoli to a microwave safe bowl. Add 1 tablespoon of oil and stir to combine. Cover bowl tightly with plastic wrap and microwave for 2 minutes. Mix and cook another 1 to 2 minutes until the broccoli rice is bright green and tender. Season with salt and pepper as desired. I used the food processor. I sauteed bacon bits and sweet onion in butter, then added the broccoli rice. OMG delicious. I use it as a bed for my chicken breast in meal prep. Makes a great and filling lunch. Thank you for the instructions! I’ve been looking for ways to make broccoli appealing to me & you’ve been a great help. Thank you! Yay, you are so welcome Sue, happy to help! Yes, a casserole with broccoli, cheese, and rice sounds delicious! I have been buying the riced veggies. Thank you so much Jessica for your help now I save a lot by making it myself. The recipes are awesome as well. Thanks again!! !